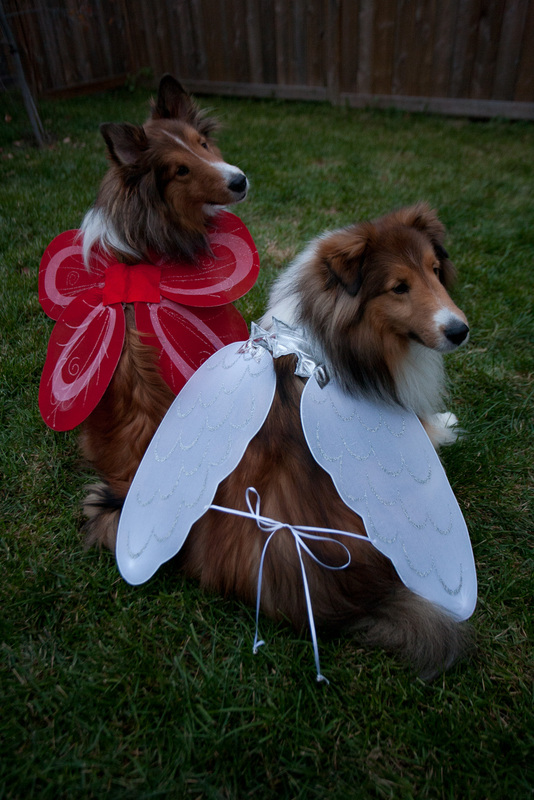 Halloween can be a scary night for dogs - especially sensitive Shelties. We don't decorate our home until we get home from work because I like the effect of going from nothing to awesome. So when we got hone we hauled all the Halloween stuff out and Indie immediately knew something was up and he wasn't going to like it. Set-up took about an hour which plenty of opportunity to dress the dogs up in silly costumes and take some pictures. Both dogs were less than amused but tolerated our amusement with the promise of cookies. When the doorbell started ringing little Indie almost lost it. The combination of frazzled Halloween decorating, baking pumpkin seeds in the oven with the fan running (Indie hates the fan sound) and the doorbell with little intruders with axes and swords damn near killed the little bundle of nerves. Never to be one to pass up the opportunity for some training we started associating the doorbell with the "crate" command and a reward. When there were fewer kids coming my husband started ringing the doorbell. By the end of the night we had eliminated the insane,emotional barking over reaction but he was still bolting to the door with a growl - all be it a little less hostile like. I am not 100% sure why the barking stopped: he could have tired out, been overwhelmed, caught on that it was my husband at the door or he truly started to react to the training.I figure it's time to work on this (one challenge at a time) anyway - we'll keep at it until its all fixed and we have TWO great dogs running to their crates when there are visitors at the door! 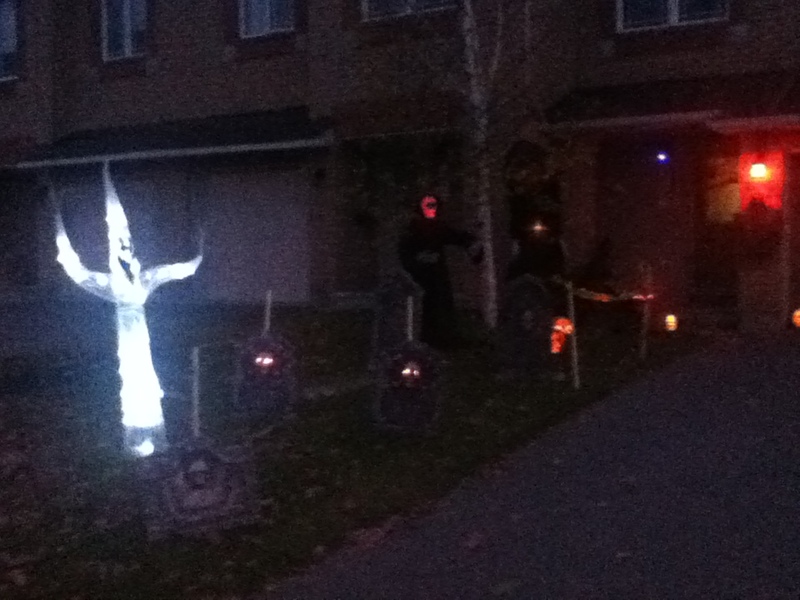 We always get lots of great comments about our "Scary House" but thus year there was a first - I made a kid cry. I think the whole experience was just too much. This is why I do not dress up - I think it would just be the candy coating on the apple to push fear in to kids. Yes, I am in fact tooting my own horn. Each Halloween my family gets together to carve pumpkins. They are always really awesome. 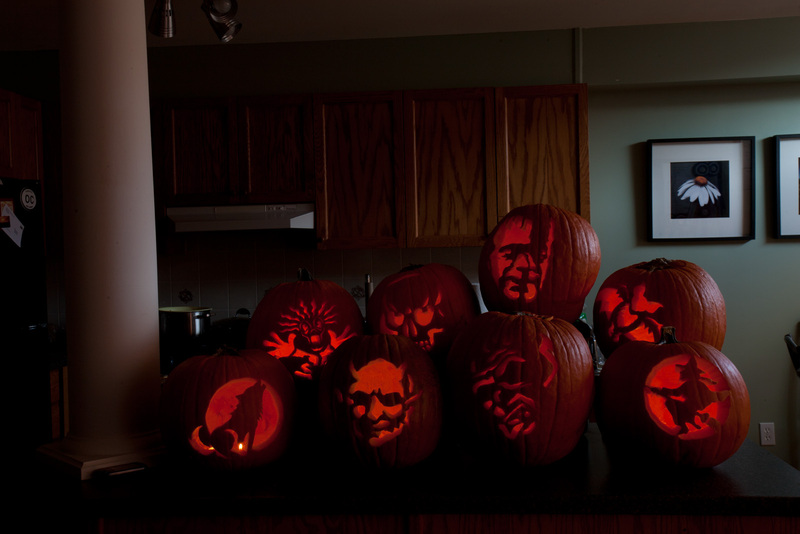 I'd like to take credit and say that my family is composed of pumpkin carving geniuses but were not, really. 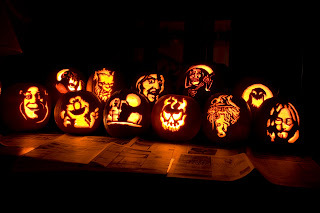 There are templates out there that you can use to carve these really awesome pumpkins. Some are easier than others but the really challenging ones are often the most impressive. 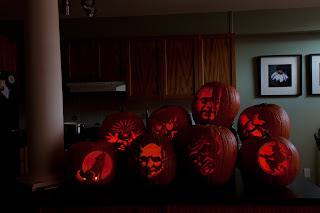 The one right below is from today but also included some more from previous years!